Start with good freehand exercises. Work on your big muscle groups. A good diet is essential. Working out is kind of a religion for fitness fanatics, they do not want to be Mr. Universe; they just want to be fit. Fit, in the true sense of the word. Most people join a gym with great expectations of being the next big thing, but after a few reps and a lot of sweat they just give up. Working out requires patience; you cannot expect to flash a six pack or an arm to show off in just a month’s time. It is slow progress and it will definitely hurt, especially for the first few days. You may be hitting it hard, but are you hitting it right? Here are tips for you to improve your muscle and fitness. A freehand exercise is the first step to being fit. There are people who are big, have volume, lift all the heavy weights but are not good with free hand exercises. If you cannot do a decent push up or one full pull up, then there is no way that you are going to get fit. Freehand exercises are the best way to get into shape and being fit, the guns and the abs can follow later. You will be surprised to see that half your work can be accomplished by doing the right type of freehand. Do not forget to do innumerable pushups, dips, pull ups, chin ups, squats, and push up between chairs and so on. Also, do jog, run, sprint or play a favourite sport to increase stamina and lose fat. Most of your muscles show up from the biggest muscles. If you have just started working out then any exercise would be good enough or intense enough to increase protein synthesis. If on the other hand, you have been working out for some time, then you will need to focus on the large muscle groups more. These are the chest, back, and legs. Do more of squats, deadlifts, pull-ups, bent over rows, bench presses, dips, and military presses when you are working out. You should do three sets of ten to twelve repetitions each, and keep about 60 seconds of rest in between. There is no replacement for a good diet when you are on your way to gain muscles. Lay your hands on chicken, eggs, milk, cheese, peanuts and all that makes you gain muscle. Eat half an hour before you hit the gym, and eat after you get back from there. Eat lots of bananas, and get in the habit of eating complex carbohydrates, go for all things brown, like brown rice and bread. Finally, you should never forget to eat a healthy breakfast, and avoid fizzy drinks, drink plain water. Most people get so busy to work their arms that they forget to work on the abdomen muscles; don’t you want a six pack? Working your abdomen muscle is good for you as it works on your core. Your body concentrates on your core, and if you do not have a fit core then your entire workout is no good. 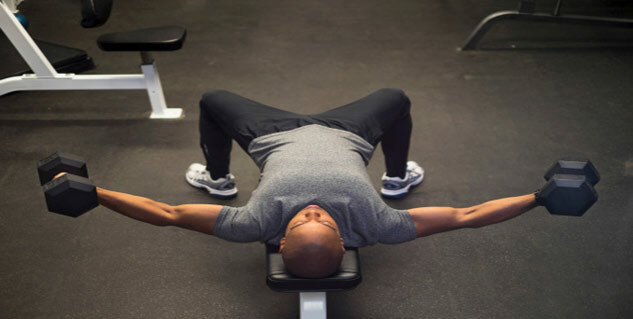 Do standard crunches every day for starters, and then you can move on to the variables of the core workout. Working out is not an issue, it is not difficult if you know how to do it and if you can bear the initial body ache. Be consistent and continue on a daily basis, results are sure to show.